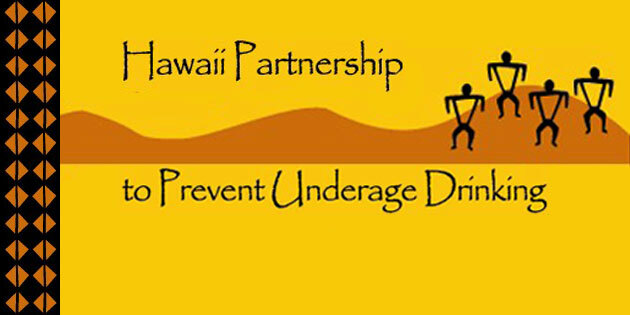 The Hawaii Partnership to Prevent Underage Drinking (HPPUD) was created to address the problem of underage drinking in the State of Hawaii. The members of the partnership represent county, state, and federal agencies, non-profit organizations, private businesses, and community residents concerned with the health of Hawaii’s youth. The current structure of HPPUD includes a Statewide Advisory Council, and four county coalitions: Honolulu County to Prevent Underage Drinking, Maui County to Prevent Underage Drinking, Kauai County to Prevent Underage Drinking, and Hawaii County to Prevent Underage Drinking. The Department of the Attorney General is a member of the Honolulu County to Prevent Underage Drinking. “Under 21 No Can” server training videos is a partnership with the Department of the Attorney General and County Departments of Liquor Control on Hawaii, Maui, Kauai, and Oahu. These two videos were developed to provide servers who work “on-premise” (restaurants, bars, etc.) and sellers who work “off-premise” (retailers, grocery stores, etc.) with information on the consequences of selling alcohol to those who are under 21 years old. The videos are meant to supplement the employee training provided to licensees by the Department of Liquor Control on Hawaii, Maui, Kauai, and Oahu. It is not meant to replace existing or future training, nor is it intended to be the sole training tool utilized by on-premise or off-premise establishments. The Statewide Advisory Council meets quarterly. Each county coalition chair reports on the progress of the underage drinking prevention efforts in their respective county. These meetings also provide an opportunity to collaborate as a cohesive unit to develop and implement statewide underage drinking prevention strategies. The objectives of the Statewide Advisory Council include support of county coalitions, coordination of an annual Youth Activist Conference and Annual Underage Drinking Prevention Conference, education on Hawaii’s underage drinking laws, and implementation of statewide underage drinking media campaigns. Each county coalition meets monthly to develop short-term and long-term strategies and projects, to share in the success of present initiatives, and to welcome newly recruited community groups. Hawaii County faces unique challenges in the fight against underage drinking due to the immense size of the island. Activities include enforcement operations, local policy changes, education of retailers, and alcohol-free graduation activities. Maui County encompasses the islands of Maui, Molokai, and Lanai, which requires individualized assessment and initiatives. This diverse county is involved in enforcement operations, alcohol-free graduation activities, and an annual Youth Underage Drinking Summit. The population of Kauai County is the smallest of the counties, yet underage drinking poses comparable challenges. Activities include enforcement operations, merchant education, Shattered Dreams (a one-day drunk driving reenactment), and Fatal Vision Goggles school presentations. Honolulu County is home to the majority of Hawaii’s diverse population. The effectiveness of this coalition has been maximized through the creation of four specialized task forces. The legislation task force is responsible for researching, developing and introducing new underage drinking-related bills and improving existing laws. Legislative goals include keg registration, an amendment to the social host liability law, and the addition of “consumption” to the current underage drinking law. Other task force goals include proposing advertising ordinances and promoting youth legislative advocacy. The goal of this task force is to provide youth and parents with educational resources and to heighten awareness within Oahu schools of the problem of underage drinking in Hawaii. Activities include youth activist recruitment, student PSA competition, an annual Youth Activist Conference, college resident advisor training and support of various media campaigns. The goal of the media task force is to increase media exposure of the harmful consequences associated with underage drinking and to build positive community support. Activities include media campaigns, promotion of youth activities, and publicity of all underage drinking activities. The goal of this task force is to reduce the ability of minors to purchase or obtain alcohol and to reduce the consumption of alcohol by minors. Activities include shoulder tap operations, compliance checks, on-premise operations, and park sweeps. Additional activities include underage drinking laws education, and decoy and adult chaperone recruitment.